It is 2015 and Groupe Intervention Vidéo, GIV for short, is now 40 years old. For this anniversary, we are planning a series of screenings and exhibitions that will take place throughout the year. For over 20 years, we have been collaborating with curators and collectives to present video programs. 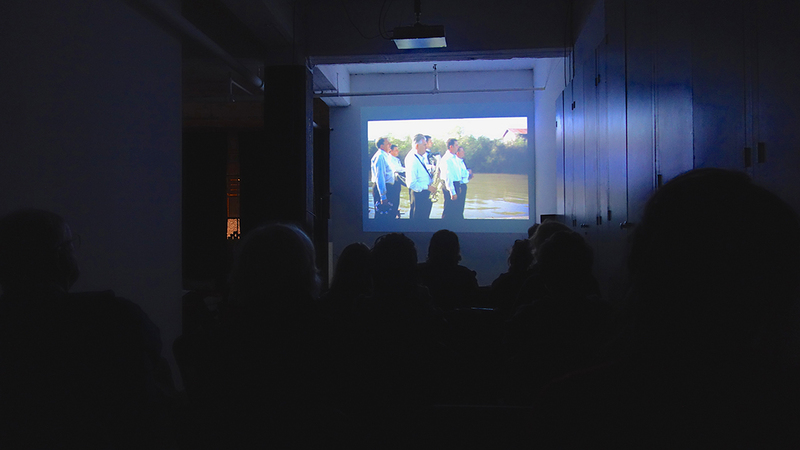 It seems fitting that one of the last curated screenings GIV hosted in 2014 was DIFFERENCE SCREEN. Bruce Allan and Ben Eastop put together an international program of works by women. I took a few notes during the screening but I felt it was more important to watch. The program was strong. It flowed. Each work seemed to each be in its correct place within the program. This is a compliment and no mean feat. My overall impression of the screening has to do with architecture(s) and how structures and spaces are inhabited, presented, transformed and figured. One work, Travelling Fields (Inger Lise Hansen) reminded me of Michael Snow’s La Region Centrale because of the insistent way it flips vantage points. Lénine en Pensant by Sophie Nys features a huge sculpture of Lenin’s head with excerpts of his own texts about the importance of women during and after the revolution. Mantra (Gordana Andjelic-Galic) presents a woman struggling to carry all the flags once associated with the formation of Bosnia. Shelly Silver looks at language, racism and narrativity as she literally builds story-blocks in 5 lessons and 9 questions about Chinatown. Signs figure prominently in Hassan et Amira – Lettre/s d’hotel/s. Director Gesa Matthies uses two images, in a kind of split-screen, to make associations between hotel signs (or typewritten word and sign), as she does with the words ‘Terminus des Ports’ and ‘De L’avenir’. There are many more excellent works in the program screened at GIV. I got swept up, abandoned my note taking and enjoyed. ‹ New York – can it be real?